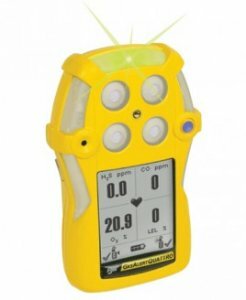 Rugged and reliable, the BW Technologies GasAlert Quattro four-gas detector combines a comprehensive range of features with simple one-button operation. With flexible power options, the GasAlert Quattro is always ready. The graphic LCD displays easy to identify icons that indicate operational information, such as bump test and calibration status for simplified onsite auditing. IntelliFlash provides continuous visual confirmation of detector operation and compliance. Suited to a wide range of industrial applications including confined space entry, the GasAlertQuattro is fully compatible with BW's MicroDock II automatic test and calibration system. The GasAlertQuattro was designed with an emphasis on simplicity, durability and reliability using proven Honeywell processes and engineering. With the GasAlertQuattro, seeing is believing. Perfect for rugged environments, the GasAlertQuattro features a durable exterior with reinforced bumpers and integral concussion proof boot to protect the detector. This rugged design keeps the GasAlertQuattro working in the most extreme weather, environments and work conditions. Relying on the GasAlertQuattro prevents costly downtime. Rigorously developed over two years with proven Honeywell engineering processes, the GasAlertQuattro is built to deliver a superior performance. All sensors on the open market were thoroughly evaluated. Alphasense and Surecell™ sensors were selected because they provide the best overall operation and reliability. Surecell sensors boast over 10 billion hours of field use and abuse. The GasAlertQuattro's field-proven sensors offer enhanced resistance to common industrial cross sensitive gases such as methanol and ethanol (CO and H2S sensors) which means more reliable sensor responses. Models with rechargeable battery pack also include a battery charger. Rugged, reliable and built to provide reliable performance, simplicity and durability. 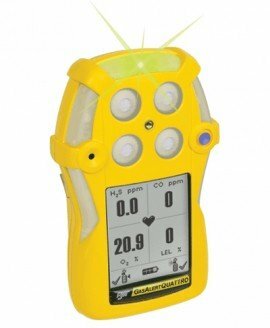 The BW GasAlert Quattro combines a nice range of features with simple one-button operation. Flexible battery options mean the unit it always ready to work. It is higher priced than the MicroClip XT but the features and battery options make the extra dollars worthwhile to me. The user-options can only be set via the IR interface and the software, not in the field. The Quattro is one my favourite models. It is so simple to use, with reliable sensors and the ability to change battery packs in the field makes this unit one of the best units out there in my opinion. It is a good fit in virtually any application where toxic and combustible gases are a concern, such as Oil & Gas, Utilities, Municipalities, Refineries, Steel Mills, Pulp, Paper and more. The sensors in the Quattro were selected after numerous field trials because they give the best overall operation and reliability. The new IntelliFlash feature provides visual confirmation of the operation and calibration or bump testing compliance. Regular maintenance is required on this model in the form of frequent Calibrations and battery replacement or charging. Bump Tests can also be performed on the unit depending on personal preference or when site safety regulations require it. Multiple User-options, such as flip display and bump test frequency for example, can only be set via the IR interface and the software, not in the field. This is both good and bad in that the options can't be changed by the everyday worker, which is great if you are the safety guy and have the detector set to match your company guidelines, but inconvenient for those users who like to make adjustments in the field themselves. Built for rugged environments, the built-in concussion proof boot provides excellent protection against accidental bumps, scratches and damage; and it is water-proof, with an IP rating of 67 it can be submerged in water up to 1 m deep for 30 minutes. The real-time gas concentration is displayed continuously on the LCD so you will always know the current levels, even when the unit is not in alarm. The unit has a built in Datalogging feature, enabling you to retrieve a detailed and accurate history of conditions and unit maintenance if needed. Calibrating the unit is required every 180 days by factory default but is quick and easy to perform; the procedure can be done in the field and only takes about 2 minutes to perform, and all you will require is a cylinder of calibration gas and a regulator. It is also compatible with the BW MicroDock II calibration and bump test station for those who wish to use a more hands-free, automated, calibration and bump test procedure.